Time to get back to the bridge. 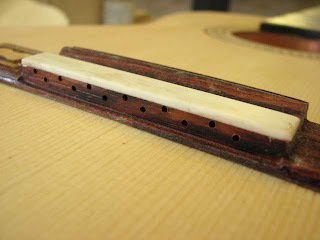 The string holes are measured out on masking tape, as its much easier to see the marks. 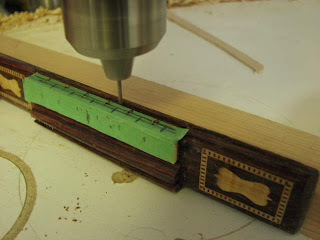 A drill press is used to drill the holes. I am running the bridge along a fence to ensure that they all line up properly. 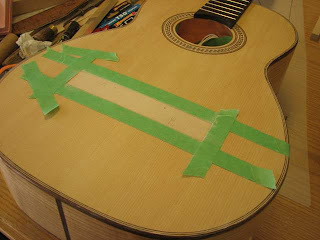 Masking tape is used to protect the soundboard finish from the sanding that is being done in the pace where the bridge will be glued. This location is VERY carefully identified. 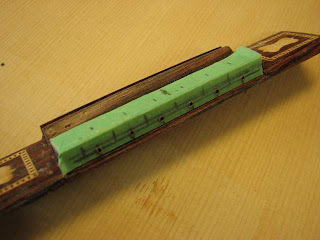 The props that are inside of the guitar enable me to simply use these cam clamps to glue down the bridge. Without the props the soundboard would never be able to take the pressure. 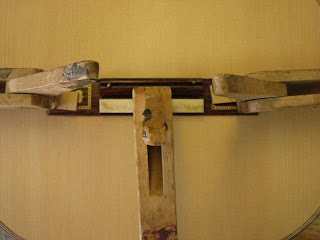 Of course, the better the fit the less clamping pressure is needed. Posted by Doug Ingram at 11:50 p.m.